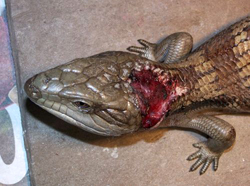 This blue tongue was run over by the lawn mower and had basically been scalped. While the injuries looked horrific, (and they were! ), the skull was intact, and the wound was clean. The member of the public was able to get the animal to us quickly where we were able to clean the wound, and administer antibiotics. Time and patience was then required as the muscle, then skin and finally scales all regrew. It took about 4 months for this process to finish.What is even more amazing is that when this bluey was released, he didn't even stop to say thank you! 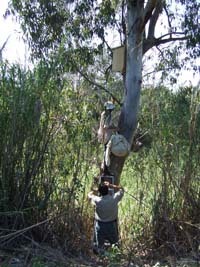 In early November of 2007, wildlife carers from Uki noticed a lot of dead flying fox pups in the Uki colony. When the call came out for assistance, WIRES Northern Rivers sprung to action. should not have been away from their mothers. There was a lot of speculation about illegal shootings of adult bats that could have resulted in this disaster, but it remains unproven. separated from his mother for many days, and was suffering from dehydration, a mite infestation, starvation and was being eaten alive by maggots. Blueberry was only away from her mother for a day or two and while in a similar condition to Arnie, she was not as bad. Rivers enjoy some of the richest bat life in the country - but it is still a far cry from the numbers once inhabiting our area. first feed of stewed apples and wild blossom, a supplement to their four bottles a day. Now that they are thermo regulating, they enjoy days spent on the airer - their own personal playground. In the next four weeks, they will fly for the first time, start the weaning process and take their next step to being wild juveniles when they move to pre release. 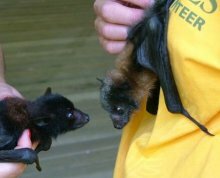 At pre release, they will experience wild bats with other juveniles their age, and learn what it is to be a wild bat. By the time the pre release aviary doors are opened, they will be totally independent of human assistance. Eight weeks of human assistance will ensure the survival of these two beautiful animals. 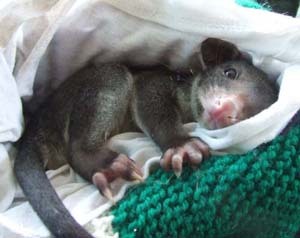 WIRES Northern Rivers would like to thank Tweed Valley Wildlife Carers for the opportunity to help during this tragedy. 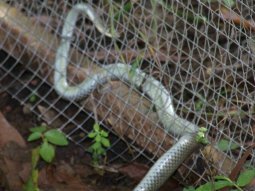 WIRES Northern Rivers often gets calls to come remove carpet snakes from aviaries. In early October 2007, we received one such call from David of Rock Valley. Before we could organise a rescuer, David called us back to say that he had managed to get the offending python into a pillow slip but had noticed something wrong with his jaw. When I spoke to David, he said he thought the jaw was broken. David offered to deliver the python to Lismore, where a carer was able to bring it to me - the carers courier service in full action! 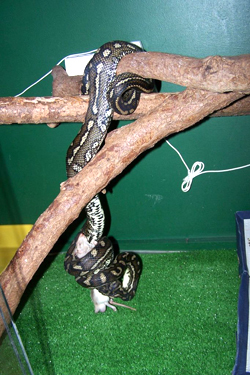 There was indeed something wrong with the pythons jaw, and a trip to the vets revealed the extent of the damage. The bottom left side of his jaw was paralyzed. Sammy, as he has become known, had come off second best with something that should have been dinner! Something had managed to chomp through the ligaments that work the bottom jaw. As a result, he is unable to feed on normal size prey. He was very skinny - evidence that his injuries had prevented him feeding in the wild. Another 3 or 4 months in this condition in the wild would have exhausted him to the point of death. We don't often think of apex predators such as snakes coming to grief this way because we often don't see the results. An injured snake would just shelter some where until it died - a process that can take up to 2 years in a large healthy python. It is lucky for Sammy that he found his way into an aviary for shelter. now able to eat small prey. 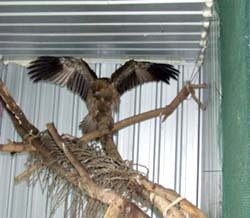 This juvenile Whistling Kite came in to care almost dead from starvation, it couldn't even lift its head. 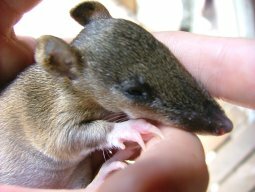 Please remember if finding native animals in distress, do not give the animal anything to eat or drink until you have spoken to a registered wildlife organisation. This little juvenile Whistling Kite almost drowned, due to having a bowl of water placed inside the box where the bird was rightfully contained. 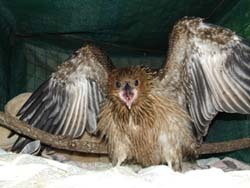 It was raised and successfully released by WIRES Raptor carer Melanie. Thank you to the McKenzie-Harris family for finding and rescuing this strange and elusive creature of the night. 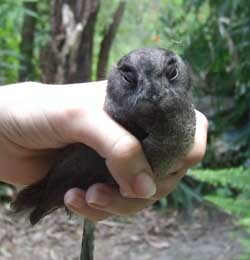 The Owlet-nightjar is a common nocturnal bird often heard, but rarely seen. To read more about this fascinating bird please click here. 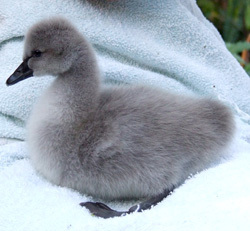 Late in August a tiny Black Swan cygnet was rescued by a fisherman while in his boat on the Clarence River at Tabulam. Recent rains had swelled the river and the newly hatched cygnet was washed away from the rest of its family, who were nowhere to be seen. He brought the cygnet to a WIRES carer in Casino. Weighing only 150 grams, the little orphan cried frantically until a large stuffed toy dog was placed in the basket with him. He snuggled under this surrogate “mother” and slept for two hours! Groundbreaking operation saves Echidna with broken snout. In August, WIRES received a call to rescue an echidna that had been hit by a car in Ballina. 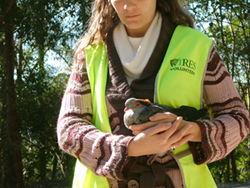 New WIRES member, Kim, went out on her maiden wildlife rescue. 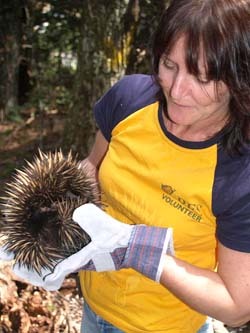 On arrival at the scene Kim found a dispersing juvenile echidna with injuries to its snout, leg and spines. Kim quickly rushed the echidna straight to Ballina Vet Hospital, where it was confirmed that the echidna did indeed have a fracture to its snout. After liaising with the Currumbin Wildlife Hospital (CWH) it was soon time for a trip across the border to see the vets and nurses now specialising in these amazing creatures. Lee sent in this story after returning from Alstonville vet surgery. Mother Mountain Brushtail brushtail must have been attacked by a dog last night the injuries to her face were horrific. The vet said she was brain damaged as well as having multiple puncture wounds. I have no idea how she was still alive as it must have been last night she was mauled. She lifted her little head a tiny bit and and put her arms around her little 500 gram girl and cuddled her as she was euthanased, watching the way she put her arms around the baby it was so beautiful, and it was just so sad. Please lock up your dogs at night when native animals are active. The plywood roof was a bit thin so I screwed a piece of fiberglass over it. I asked Envite to help and they happily agreed. 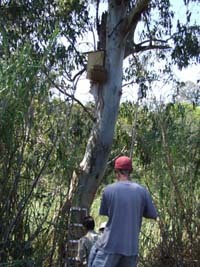 Richard the team leader did the attaching of the possum box, and Philippe, who is going to take over as team leader, gave excellent advice re attaching to tree ( threading wire through holes in top of box then threading through hose to go around fork of tree) He has put up lots of sugar glider and owl boxes in Lismore for Landcare. I then brought the possums, tucked up in their drey with a blanket tied securely around them. Richard again climbed up and hung them near the box. He carefully removed the blanket when he was nearly on the ground, then Philippe used a stick to remove the small towel I had tucked over the doorway. Thank you to the Casino Envite crew for their excellent assistance. 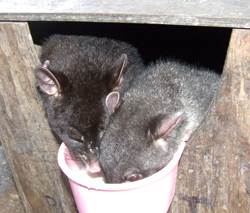 These possums were taken in to care due to being found hiding under the stairs at Casino Public school, as a school fair was taking place, it was decided that the possums would be safer in care, untill a suitable home could be constructed, and they could be returned as seen above. This little female Mountain Brushtail possum was found alone by Steve at Broadwater. Her weight was just 170 gram, she would not have lasted very long if Steve had not reacted, and called WIRES immediately. She is seen here some time after arrival now 300 gram, as you can see she is doing well in care. Our little possum is doing well in care seen here with her little friend, a male Mountain Brushtail possum also in care. He is in care due to a dog attack in which his Mum was killed. Once again we are reminded to keep dogs secure at night. 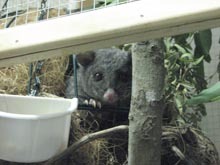 Our little Mountain Brushtail possum has grown up, released for some time she was spotted in the company of a male, not the one she grew up with, but a wild male obviously very interested in our female. It is always very satisfying seeing a released animal back in the wild. This juvenile Red Necked wallaby is currently in care with WIRES, we would like to thank Steffan and Sam from Nimbin for rescuing this little fellow as he would not have survived for long without intensive care. If you wish to see more images of this little wallaby please click here, we will update with more images as he grows. 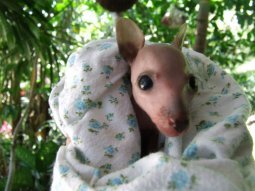 Thank you Nina for ensuring this little joey was brought in to care immediately after her Mum was killed on the road at Wilson's Ck. 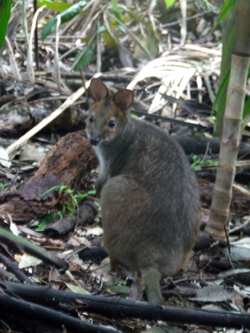 She is a Red-Legged Pademelon now listed on the vulnerable species list. WIRES macropod carer Katy will raise her untill she is old enough to fend for herself, and she will be released back in her home territory, where we hope she will breed many more of her species, ensuring their survival in the future. Our little orphaned Red-Legged Pademelon all grown up seen here being released back to the wild. 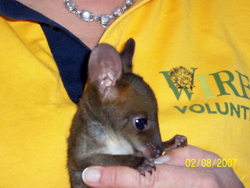 Thank you Sarah for calling WIRES, this juvenile Whiptail Wallaby would not have survived on her own for very long. She would have been dependant on her mothers care and milk for many months when you found her alone on the road. 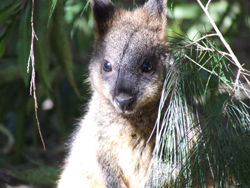 As you can see she has done well in care, she is being raised with other wallabies of similar stage of development, and will be released back in her home territory when ready to fend for herself. Thank you Emma for stopping to check the pouch of a dead Wallaby hit by a car at Tuntable Falls. 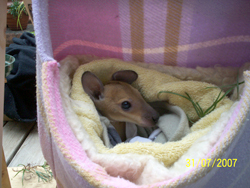 This little joey was un injured in mums pouch. Emma called WIRES immediately after finding the joey which is now in care with WIRES. It will be released in time when old enough to fend for itself, some 7-8 months from now. 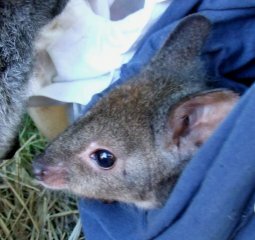 Unfortunately the little wallaby did not make it through to release, he died from a brain hemorrhage late August. We have no warning that this will happen, it is usually caused due to the initial accident, it is unusual, but it certainly does happen from time to time. Being a carer for these animals is not always easy, the way we have to look at things like this, is to remember that the animal involved did not suffer, it was well fed, warm and secure for the time it spent in care. These two juvenile Swamp wallabies will grow up together, and be released in time with other Swamp wallabies as a family group. Both came in to care as a result of car accidents only few days apart. Please take care on country roads at night, wildlife is not educated on road safety. This Topknot Pigeon was caught by a Brown Goshawk. Human intervention interrupted the natural feeding cycle and WIRES received a call requiring us to assist the poor bird. WIRES NR have received two Topknot pigeons this season from the Rosebank area, both taken from the sky by the Goshawk who was then scared off by a human who accidentally interrupted nature. Neither pigeon survived, and the hawk missed out on a meal. Sometimes it may be best to observe nature, rather than intervene. As a wildlife carer, I often have people just turn up at my door with a critter in need. I never turn these people away, and do everything in my power to help these sweeties. Tonight was one of those occasions that someone knocked on my door. The lady and her three kids had a tiny orphaned Mountain Brush tail possum. 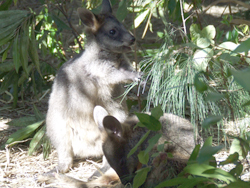 The joey was of a viable age and size, and our branch has raised many such orphans over the years. They had found the joey some eight hours prior, but only just now bought me the joey. Eight hours of inadequate heat, lack of appropriate feeding and fluids means that this poor little darling is not likely to make it. This was an avoidable situation, and for me, is heart breaking. I can not stress enough the importance of contacting WIRES immediately when animals are found. Even the smallest delay can tip the delicate balance of life and death in the wrong direction. The joey is now on its way to a specialist who may be able to work some magic. Lets cross our fingers and hope that luck is on this joey's side, as so much has already been stacked against him. UPDATE: Sadly the little possum did not recover, and died within hours of being brought to the carer. This juvenile Squirrel Glider fought hard to overcome infection caused by a cat attack. The tiny Glider was brought to Lismore Vet clinic for antibiotic injection s, but unfortunately the glider died after 3 days in care. they are a vital part of the environment. 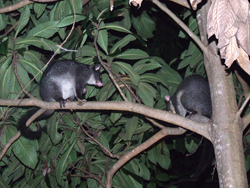 They are the largest method of seed dispersal for rain forest plants. 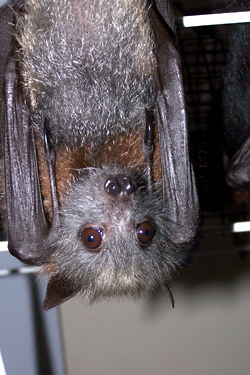 Alissa is a Grey Headed Flying Fox, and is a lucky bat to be alive! Her ordeal started when her mother flew into power lines and was electrocuted. While her mother died instantly, Alissa did not, and was stranded on the lines, cling to her dead mothers body. Neighbors noticed her there, and thought she would die fast, so they left her to die. Two days later, she dropped to the ground, and clung to a fence, screaming for her mother. Again, neighbors just left her to die. Eventually, a visitor to the neighborhood spotted her, and called us to rescue her on 5th December, 2006. When I got Alissa, she was a scared little 50 day old bat. At this age, she was too young to care for herself and was totally dependent on her mother for her survival. Burns to her wing membrane and stomach were visible, as Alissa had received a secondary electrocution while she clung to her mother. A week after she came into care, her burns healed nicely, but she remained very unsettled and emotionally needy. There is no doubt that this young lady had an ordeal, and the scaring she received was more than just physical. Her agony was long as the neighbors had just left her to suffer. 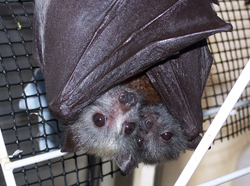 Alissa remained in care with me until she was 80 days old, in the company of another bat in care named Robbie. When she could fly, she was moved to a release aviary where wild bats could come and educate her on how to be a wild bat. 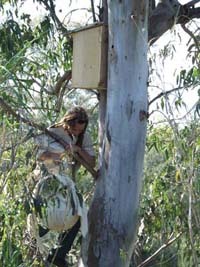 She was released with her fellow rehabilitated bats into the wild population that were frequently visiting her in February 2007. Alissa's survival instinct was great, and she will now live a full and productive life. I know what a great job WIRES NR does in our area to care for wildlife and that much of the cost comes out of the pockets of your wonderful volunteers. Every year I donate the annual increase in councilor fees to worthy groups through the Lismore community and as we approach the end of the financial year, I had $60 remaining to donate. It is not much but I suppose every bit helps. Thank you so much for your help. It was a double rescue. You rescued me as well as the baby snake, you know. It’s a great thing you WIRES people do. Rest assured, you made a difference that day! 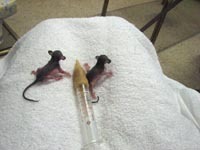 2 tiny Sugar Gliders came in to care in February the result of a cat attack. Their weights were a tiny 6 gram each. Unfortunately on e did not survive the trauma, the other has done well in care, seen here 12 weeks after arrival. 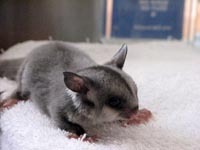 Thank you Vicki for calling WIRES, your prompt action saved the life of this little Sugar Glider. It cannot be stressed often enough just how important it is to check the pouch of dead marsupials. WIRES received a call on the emergency phone line from a lady whose dog had the previous evening killed a Ringtail possum. The caller disposed of the body of the possum the following morning in a plastic bag, then threw the bag in the garbage bin. 7 hours later the lady had reason to once again open the garbage bin, and to her horror noticed a small baby possum sitting on top of the plastic bag. She quickly grabbed the little possum and called WIRES. WIRES carer Leoni went out on that particular rescue and when she arrived she asked to see the mothers body. As Ringtails rarely have just one baby, there were good reason to believe that there may be another baby still in the garbage bin, or in the pouch of the dead mother. 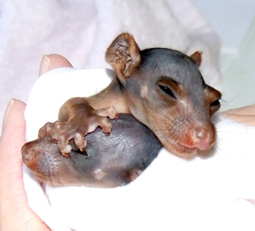 Leoni was right, in the pouch she found the second baby possum. Weighing just 43 and 44 gram, both little females were cold, exhausted, hungry and very frightened. Leoni brought them home, warmed them up and finally was able to re hydrate and eventually feed the poor little creatures. 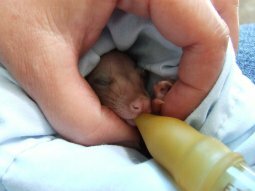 We hope that their ordeal may help to educate others in the importance on checking the pouch, some little joey or joey's, as in cases such as Ringtails and Gliders, may be very much alive even though Mum has suffered a fatal injury. It is just great when a community gets involved in the plight of a native animal, as in this case. This Red Necked Wallaby is having a hard time, WIRES received calls from different land owners over a few days, all reporting this animal in trouble, still mobile, but with eye problems, and wanting foo d. All have been feeding her, already having a soft spot for her, as she has been around for at least 19 years as far as we can ascertain. As the story unfolds it looks as if this animal has been hand raised many years ago, and still remembers her "home". One lady reports that they have had to put screen doors in to stop her entering the house, but she worked out how to open the screen doors also, and now comes in at her leisure. She has been observed having a joey each year throughout the years she has been seen in the area, this year she is having twins. 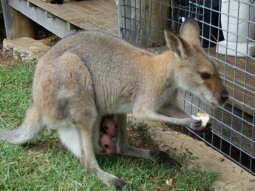 It is rare that wallabies produce twins, and this being a fairly old wallaby would certainly be putting a strain on her system. She has been fed quite a lot of bread, and this is of course not a good diet for a wallaby, it can in fact do much damage to the system, so we are now working on changing her diet, hoping her condition can improve, and she will be able to raise her twin joey's. This community of people will certainly do their best to ensure she gets the best chance of this. All keeping an eye on her, communicating as to her movements and condition. WIRES will be supplying supplementary food, and eye drops for her eye infection, as one member of the community is able to put drops in her eyes. 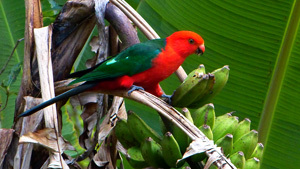 WIRES do not recommend feeding wildlife, native animals need native food, supplementary feeding of wildlife can lead to over population, and incorrect diet. In this case the animal is reliant on being fed having been fed for many years. 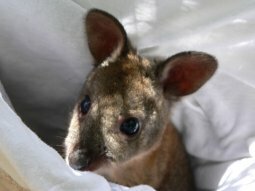 In order for this wallaby to have a chance of raising her twin joey's, she will need assistance. 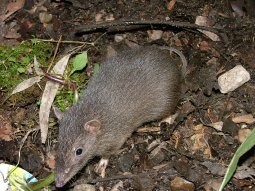 WIRES carer Alicia currently has this little Northern Brown Bandicoot in care. She arrived in to care in late January after a dog attack, she sustained dog bites to her back, and was on antibiotics for a while to fight infection. She has come through it all, and is now outside in an aviary, eating fresh natural foods, and will be released back to the wild when she is a bit bigger, and able to fend for herself. Her mum and siblings did not fare as well, one sibling was found 2 days after this little lady, but he did not survive due to exposure and dehydration, he died 1 day after coming in to care. Their Mum was killed outright by the dog. If you live in the bush, please ensure your domestic pets such as dogs and cats are safely indoors, or secured before dark, and not let out till after first light in the morning. 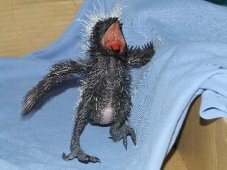 Pheasant Coucal' s build their nest close to the ground, and unfortunately this can lead to orphans such as this little chick coming in to care, due to predators such as cats and dogs having destroyed the nest and possibly killed the parent birds. 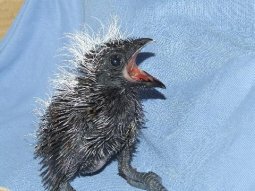 This very young chick is currently in care with WIRES carer Melanie, it will be released back to the wild when old enough to fend for itself. 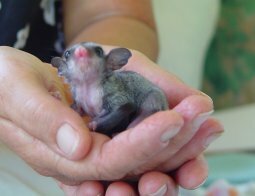 When Wendy found this tiny Squirrel Glider in her dead mums pouch, her decision to call WIRES immediately most likely saved it's life. Weighing only 12 gram, this little g lider was in need of intensive care. WIRES carer Katy went in to action as soon as she received the little glider, giving her the intensive care she needed, and as a result she has survived and will eventually be released back in to the wild. Unfortunately most Squirrel & Sugar Gliders come in to care due to cat attacks as was the case with this little one. Thank you Wendy for your prompt action. Charles called WIRES immediately after finding this very young Mountain Brushtail possum joey in her dead mothers pouch. Mum had most likely been killed by a dog. 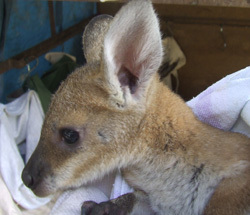 WIRES rescuer Julia collected the joey and she was transferred immediately to WIRES intensive care specialist Leoni. This joey is a mere 80 gram currently, considering she will be above 2 kg when finally ready for release, the road ahead is long. She will be in care for approximately 12 months as long as all goes well for her. Thank you Charles for being vigilant, and checking the pouch of a dead possum. 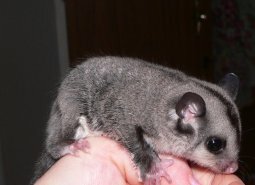 Our little Mountain Brushtail possum is growing up, seen here 12 weeks after arrival in to care. She is now fully furred, still being fed on special possum formula. 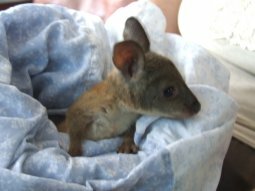 This very young Swamp wallaby joey was brought in to care after being found in her dead mothers pouch on the road at Bangalow by Patricia. She has bruising to her leg, but no broken bones. She will be in care for about 11 months before being released back to the wild. Thank you Patricia for stopping and checking the pouch of a dead animal on the road. 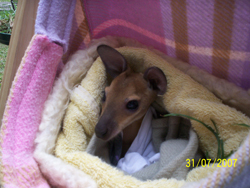 Without you this tiny joey would not have survived. This little fellow arrived in to care after being found on the road leading in to Byron Bay. How he was orphaned is any ones guess, he was certainly not yet old enough to be alone without Mum. Sugar gliders will carry their young on the back after emergence from the pouch at a fairly early age, the juveniles now travel along on mums back, exploring whilst she feeds, hopping back on at any disturbance. Holding on to her long fur whilst she gliders through the trees, or runs along to the next branch. He will stay in care until he is old enough to fend for himself, in about 6-8 weeks time. Snakes are not in a position to withdraw once caught in things like wire fencing. 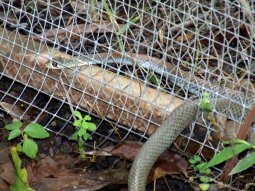 They will become trapped as in this case where a Yellow faced Whip snake was lucky to be spotted just after becoming trapped. It was rescued by WIRES snake handler Rick, and released unharmed. Had this snake been trapped for prolonged time, things may not have turned out so well for the snake, so please call immediately if finding a snake in distress such as this. 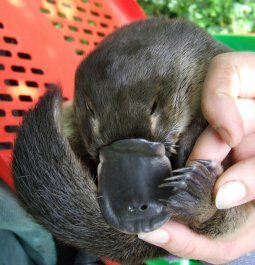 This juvenile Platypus is currently in care with WIRES, it was found by Coen, Jake and Mandy on the bank of a creek, covered in ticks. Suffering from Pneumonia and exhaustion we can only guess what may have happened, considering recent heavy rain in our local area, he may have been washed out of a burrow. WIRES carer Ralph transported the Platypus to Lismore vet clinic where he was treated before going in to care. Thank you for being vigilant and calling WIRES immediately on finding this little fellow. For Sue and her friend. 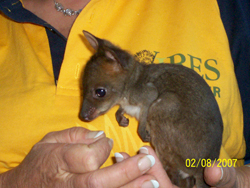 This little fellow is a Red Neck Pademelon, he was rescued by Sue Johnson from Goonengerry in early December 2006. 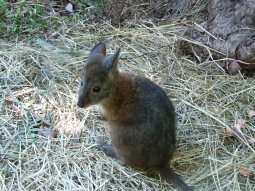 Sue came across a dead wallaby on the road and stopped to check the pouch, Mighty Mouse as he was named is what she found. Very frighte ned but unharmed. 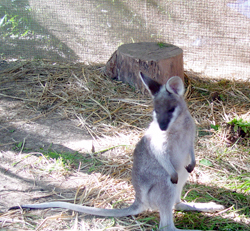 He is currently in care with a number of other wallabies, and will be released in about 4 months time. Thank you Sue and also thank you to your friend for stopping and calling WIRES. Mighty mouse is doing well, seen here 10 weeks after coming in to care, very active at night, sleeping his days away in his pouch.